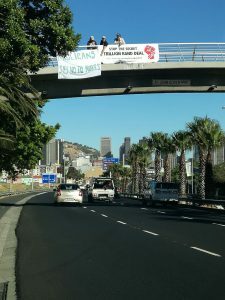 On the day of the State of the Nation address, Green Anglicans joined the “Occupy the Bridge” action to protest the R1 Trillion secret nuclear power deal. Civil society voiced their calls on the President, as the head of the South African government, to give power back to the people, to be accountable and to uphold the constitution of the country. The R1 trillion deal was hatched in secret and money spent on the nuclear deal will mean much less money for education, healthcare, social grants, transport, housing, sanitation, jobs etc. The deal will bankrupt us, the citizens, and keep us in debt for decades. It is estimated that we will have to pay R100-billion a year to cover the bank loans, which will mean increases in our already high cost of living. At a previous State of the Nation Address, the president promised that any decision to procure nuclear would follow a fair and transparent process. In 2014, the South African government signed an international agreement with Russia to build nuclear power stations in South Africa. This nuclear deal and associated government decisions have taken place in secret, without consulting with the public, and have already seen friends of President Jacob Zuma benefit from tenders awarded. Science and economic experts have demonstrated that nuclear energy is not the answer to South Africa’s energy security. At its provincial Synod in 2016, The Anglican Church of Southern Africa passed a unanimous resolution stating the Anglican Church’s opposition to the government’s stated intention to expand its nuclear energy programme in South Africa. We call on all South Africans to join us in opposing the nuclear deal, and in support of the court action by SAFCEI AND Earthlife Africa to overturn the secret nuclear deal for a cleaner energy future for South Africa. Say NO to the Secret Trillion Rand Nuke Deal! Join the Campaign! The following organisations are already involved, Safcei, Right to Know, Earth life Africa, One Million Climate Jobs and many others. Thank God at last Christians are starting to stand up to this godless government; it won’t just keep us in debt for decades, but for ever; till Jesus comes, as President Zuma likes to say. We have surplus electricity, Eskom tells us; so why this nefarious, blood-letting deal that will turn our children’s children into slaves to the banks that lend the money to build these monstrosities; till the next Chernobyl.